Henry Smith is creating Spaceteam and more free games! Hi, I'm Henry. I made the co-operative shouting game Spaceteam (official website). I want to keep Spaceteam alive and make more free games, and if you like Spaceteam, Patreon is the best way for you to help out. 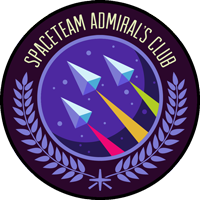 As my patron, you contribute whatever you can—as little as $1 per month—and you'll become a member of the Spaceteam Admiral's Club. You'll get special rewards (check out the sidebar! -->) and I'll be able to focus on interesting, accessible game design without having to charge money or use ads, time-limits, or micro-transactions. My next game is a cooperative puzzle treasure hunt, called Blabyrinth, but I can only make it with your help. This is a pretty new way of funding game development. It's more sustainable and it gives me more freedom to make smart choices in an unpredictable business. I think it's pretty exciting and I'd love your support. Please spread the word to all your spacefriends, send them here and get them to join... the Spaceteam Admiral's Club! If you have any questions or just want to chat, you can join me on the forum or send me an email. Thank you so much for your kindness and support and fan art and hilarious App Store reviews. I love you all! Monthly updates about Spaceteam and my new games! Spaceteam Lexicogulator: Put your own words in the game. Make it pirate-themed, medical-themed, whatever you want! Your control and medal will be added to the official app and show up in Spaceteam games all over the world as people play!